Sciatica exercises have two main functions; On the one hand, they help to minimize pain, and on the other they are useful for reducing the recurrence of crises. 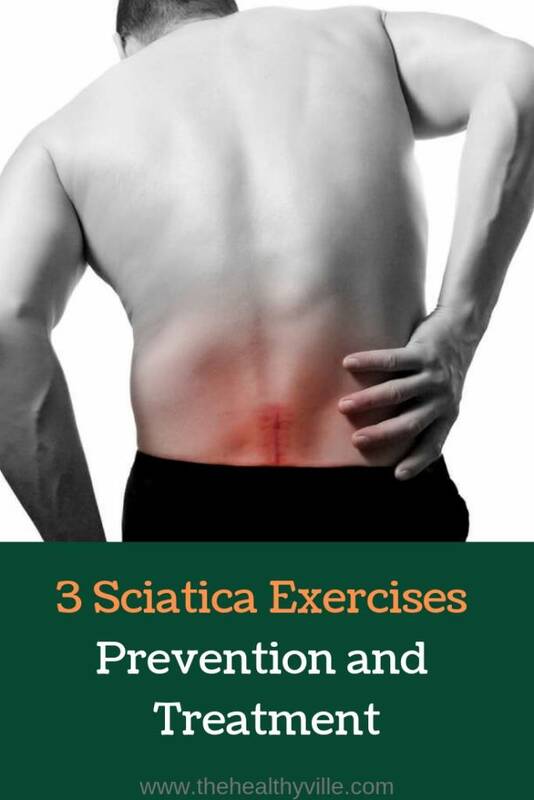 There is a set of sciatica exercises that can be included in a plan for the prevention and treatment of your symptoms. While it is true that the condition improves with rest, physical activity is recommended to strengthen the affected areas. When muscles and structures remain inactive, their support capacity decreases and the risk of injury or strains increases. This situation not only prevents the improvement of pain, but can lead to complications or damage of greater care. On the contrary, the movements facilitate the exchange of liquids and nutrients within the discs and areas near the sciatic nerve, which avoids their irritation. Therefore, it is not strange that doctors recommend an exercise program for optimum recovery of patients. The sciatic nerve begins in the lower part of the spine. According to the affected area symptoms will manifest. Before reviewing the main exercises for sciatica, it is important to explain what this condition means and how it manifests itself. Sometimes the term “sciatica” is used incorrectly, since many use it to describe pain that has nothing to do with the sciatic nerve. Sciatica is a set of symptoms that arise when the sciatic nerve is compressed or irritated. The pain may begin in the lower back (lower back), radiating to the gluteus, the back of the leg and the end of the foot. Most of the time it affects only one side of the body, however, in small cases there is a type of “bilateral” sciatica, in which both sides are compromised. Along with pain, symptoms such as tingling, muscle weakness and movement limitations can be triggered. However, their level of intensity varies in each case, according to the underlying cause. While sometimes it is the result of an injury or accident, in other cases it indicates diseases such as disc herniation or stenosis of the spinal canal. What are the characteristics of sciatica exercises? The exercises must have a medical diagnosis and a follow-up by a physiotherapist. Exercises for sciatica are one of the most recommended therapeutic measures against this problem. Its practice has two purposes: first, to diminish the existing pain in the short term; Then, provide conditioning to avoid the reappearance of symptoms. In all cases it is important to have the supervision of a physiotherapist, chiropractor or certified trainer, since a poorly designed program can worsen the condition. On the other hand, these professionals can monitor that the positions are correct. Similarly, before suggesting any routine, the doctor must determine an accurate diagnosis to clarify the underlying cause. Although uncommon, sciatica can be due to by fractures, tumors, or infections that require other treatments. What are the best exercises for sciatica? Core and back exercises are the main groups to reduce sciatic pain. Strengthening exercises aim to increase the support capacity of the spine, muscles, ligaments and tendons. Often work the lower back, but also focus on the abdominal muscles, glutes and hips. Together, these exercises for sciatica keep the muscle groups active and reduce irritation of the sciatic nerve. Among other things, they increase the strength of the spine and facilitate movements that require more flexibility. A large part of the prevention and treatment of sciatic pain is based on stretching exercises. This type of activity focuses on increasing the flexibility of some muscles that tend to be stiff or stiff. Regardless of the diagnosis, doctors recommend stretching of the hamstring muscles. These muscles are located on the back side of the thigh and its tension usually affects the appearance of pain. Aerobic exercises allow oxygenate the affected area and reduce pain. One of the components of the recovery process of sciatica is low impact aerobic exercises. By not supposing too much effort, they are ideal to relax the affected areas and stimulate circulation. Another of its benefits is that they facilitate the use of fluids and nutrients for optimal maintenance of the discs and affected areas. In addition, its ability to release endorphins produces an “analgesic” effect that minimizes pain. Finally, it is important to remember that these exercises for sciatica should be complemented with good body posture. Maintaining an incorrect position can increase the pressure on the nerve and, therefore, pain crises. Don’t forget to SHARE the sciatica exercises with your friends and family on your social networks!